precipitation of small balls or pieces of ice (hailstones) with a diameter ranging from 5 to 50 millimeters (0.2 to 2.0 inches), or sometimes more, falling either separately or agglomerated into irregular lumps; when the diameter is less that about 5 millimeters (0.2 inch), the balls are called ice pellets. ice covering a costal strip of low-lying land backed by mountains; the surface of an ice piedmont slopes gently seawards and may be anything from 1 to 50 kilometers (0.6 to 31 miles) wide, fringing long stretches of coastline with ice cliffs; ice piedmonts frequently merge into ice shelves; a very narrow ice piedmont may be called an ice fringe. a fall of unbranched ice crystals, in the form of needles, columns, or plates, often so tiny that they seem to be suspended in the air; these are visible mainly when they glitter in the sunshine (diamond dust); they may then produce a luminous pillar or other halo phenomena; this hydrometeor, which is frequent in polar regions, occurs at very low temperatures and in stable air masses. 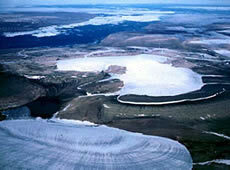 a shaking of ice caused by crevasse formation or jerky motion. 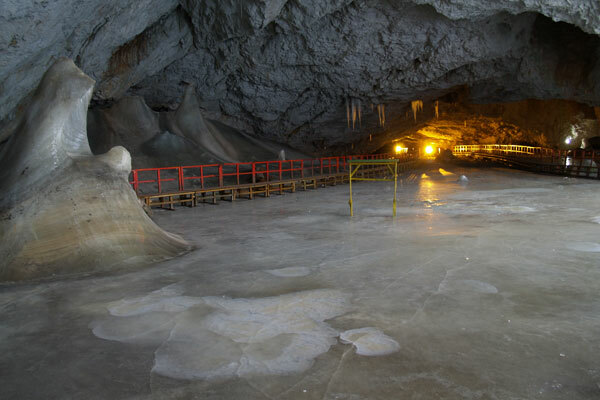 a brittle, shiny crust of floating ice, formed on a quiet surface by direct freezing or from grease ice, usually in water of low salinity; thickness less than 5 centimeters (2 inches); easily broken by wind or swell, commonly breaking into rectangular pieces. a mass of ice resting on rock and surrounded either by an ice shelf, or partly by an ice shelf and partly by sea; no rock is exposed and there may be none above sea level; ice rises often have a dome-shaped surface; the largest known is about 100 kilometers (62 miles) across. the formation of discrete layers or lenses of segregated ice in freezing mineral or organic soils, as a result of the migration (and subsequent freezing) of pore water. 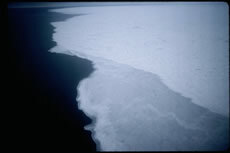 from the point of view of the submariner, thin places in the ice canopy, usually less than 1 meter (3.3 feet) thick and appearing from below as relatively light, translucent patches in dark surroundings; the under-surface of an ice skylight is normally flat; ice skylights are called large if big enough for a submarine to attempt to surface through them (120 meters, 131 yards), or small if not.